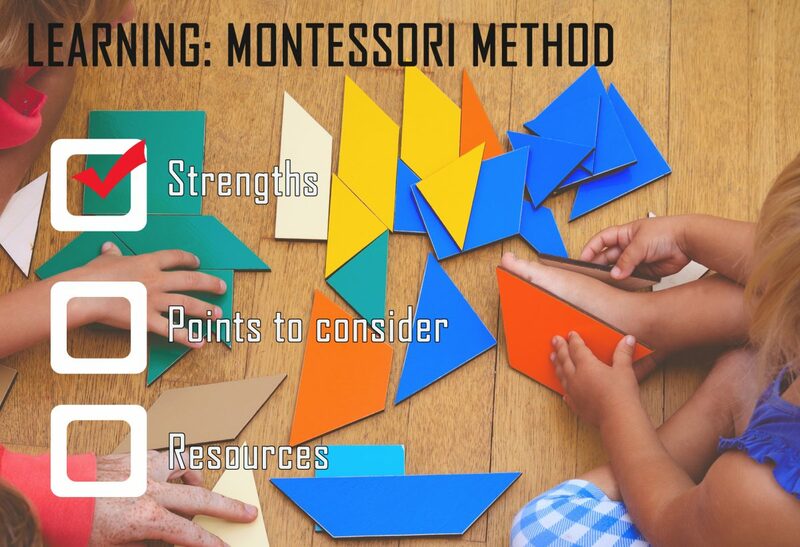 The Montessori method was developed out of the psychology work of Maria Montessori, an early 20th century Italian physician and educator who worked with special-needs children. She believed that children learn best in a “properly prepared environment” that promotes independent learning and exploration. This student-based approach uses free movement, large unstructured time blocks, and multi-grade classes. Quality and natural learning materials are kept well organized and made available for the students to work with, believing that children will be drawn to what they need to learn. Montessori homeschoolers will often set up learning centers in their home such as a math area, a sensory area, or a practical life area. A typical Montessori day might include a circle time; plenty of time to work at different stations with manipulatives such as sandpaper letters; numerical rods, or puzzle maps; time spent playing outdoors; foreign language instruction; listening to stories; and, time spent practicing personal care or homemaking skills. Maria Montessori, The Montessori Method (Frederick A. Stokes Company, 1912). Maria Montessori, Dr. Montessori’s Own Handbook (Frederick A. Stokes Company, 1914). Tim Seldin, How To Raise an Amazing Child The Montessori Way (DK, 2006).